"I never imagined being in a high school full of kids cheering for me and doing something amazing like this for me. I don't know what someone could want more than to be honored like this." "Amazing," is how Army Spc. Tony Chobanov feels about the support he's received from a veterans organization that's building a house for him and his family, and the students who have helped raise funds to pay for it. 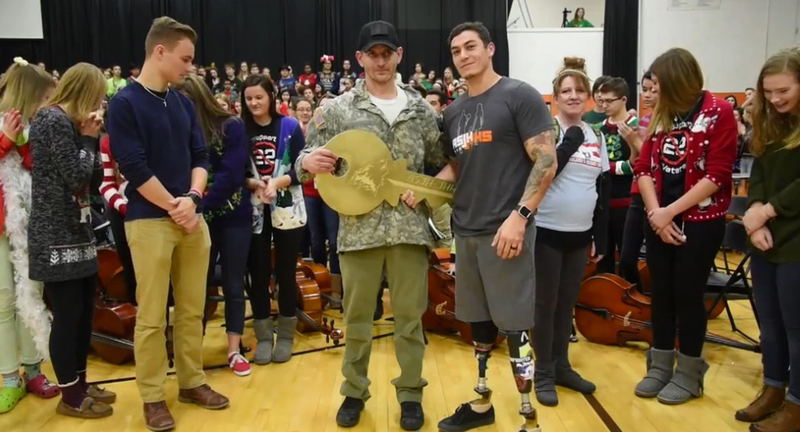 Some 2,000 students at John Hersey High School in Arlington Heights stood and applauded Friday as Chobanov and his wife, Abbey, walked into the school gym for an assembly where they were presented with a $16,000 check and an oversized key that represents their new house to be built next spring in Spring Grove. Chobanov, 32, served two tours of combat duty -- one in Afghanistan and one in Iraq -- that led to his diagnosis of post-traumatic stress disorder and a traumatic brain injury. He's worked several jobs in the trades since returning in 2008, putting in long hours to provide for his family, but has struggled as half the family income has gone to pay the rent of their Naperville home. This year, he learned he, his wife and three children had been chosen by A Soldier's Journey Home, an Arlington Heights-based nonprofit, to receive a new house. He said he's receiving treatment for his war injuries and no doubt has been helped by the support he's receiving.